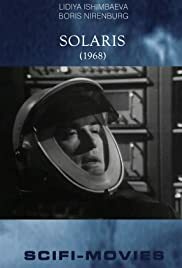 Well, watching TV movies from the Soviet Union is a new experience to me, but being a big fan of Tarkovsky's Solaris (1972), I was always naturally curious to see the true original. I've now seen and reviewed all three film versions of Solaris (the other being the Americanized 2002 version). Seeing this leads to a better understanding of why Tarkovsky's feature film was necessary- this 1968 film is not satisfactory, and bears parallels to TV movies produced in Western society in later decades. You can see what's missing from this version, and what Tarkovsky added- a Kris Kelvin with sad eyes, a more distressed and lost Hari, a moody score (the 1972 film makes brilliant use of Bach's Ich ruf' zu dir, Herr Jesu Christ), and a convincing sense of Kelvin's deterioration. It's missing the convincing, colourful sets (according to Akira Kurosawa, Tarkovsky's budget was quite extravagant). It's missing some subtlety, as Kelvin's narration tells us Hari can't be Hari the first time she appears, and Snaut and Sartorius explain to each other why Kelvin won't let go of Hari. It's missing the foreshadowing that came with Burton's video in the 1972 film. Of course, Solaris is a great story, and much of the story is conveyed here. It is merely presented in a blander, less hypnotic and ultimately forgettable style.